ORANGETOWN. 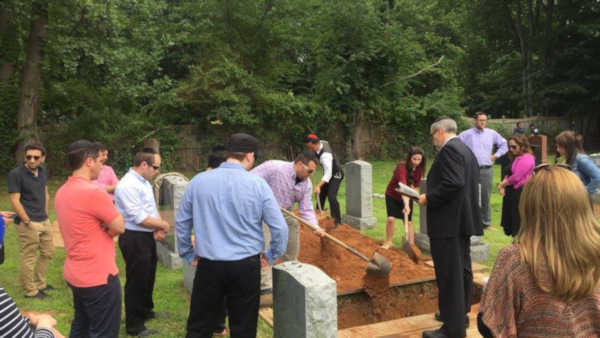 New York -- About 30 people have paid their respects to a woman they never met after responding to a call for attendees for a suburban New York funeral that no one was expected to show up. Stein died at the age of 83. Rabbi Elchanan Weinbach officiated the service and says there was no eulogy because he didn't know anything about the woman. Weinbach told ABC News, "I was struggling with how to lend dignity to a service where the only people who were going to be there were professionals who had no connection to the deceased and I knew nothing about her. I discussed it with my daughter and she suggested that maybe she could get some of her friends out to the cemetery so this woman would not be completely alone at her funeral." "I was amazed at the turnout and deeply touched," Weinbach said. "It was the middle of the day many people came from work and took the time to honor a life departing for this world. I was moved and speechless by the response." Weinbach learned at the cemetery that Stein was a musician, had been a teacher at the Julliard School, and was a 10-year resident of Munsey Park Home Care Services for Seniors before being transferred elsewhere. Click here for more feel-good stories!